U.S. Rep. Randy Hultgren Endorses Tom Weber! 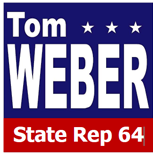 LAKE VILLA - Former United States Congressman (IL 8) and current nationally syndicated radio talk show host Joe Walsh has endorsed Lake County Board Member Tom Weber, for IL State Rep, 64th District. "More than anything right now, Illinois needs independent fighters," Walsh said. "People who will go down to Springfield and fight for Illinois taxpayers. People who will fight to stop the exodus out of the state. Tom will be that fighter. I've known Tom for seven years, he's a true limited government Conservative. And he is so accessible to his constituents. He's what the people of this district need. No one will work harder than Tom Weber." SPRINGFIELD - The Contractors for Free Enterprise, the political affiliate of the Associated Builders & Contractors, Illinois Chapter, an organization of 400 companies involved in the commercial and industrial construction markets in Illinois, has announced its endorsement of Tom Weber for election to the Illinois General Assembly. "ABC is pleased to extend its endorsement of Tom Weber for election to the Illinois House of Representatives," said ABC, Illinois President Alicia Martin. "Tom Weber has demonstrated an understanding of how decisions made in Springfield impact the economic well-being of ABC members, their employees and the economic competetiveness of our state," Martin explained. "Election of Tom Weber is important to making sure that Illinois turns the corner to attracting and creating high paying Illinois jobs with good benefits." ABC, Illinois Chapter was established in 1975. ABC, IL aggressively promotes and protects the free enterprise system and the Merit Shop Philosophy. It is one of 80 chapters of the national Associated Builders and Contractors, Inc. (ABC), one of the most influential trade associations in the United States. ABC, IL is the only construction association that unites the entire construction team to work together for their own mutual benefit and the construction industry. 8/23/2018 Lake Villa, Illinois: Lake County Board Member Tom Weber, candidate for Illinois State Representative District 64, releases list of endorsements from local leaders. Tom Weber said, “I am humbled to have the support from so many community leaders. Thank you for believing in me and for your endorsement.” Weber continued, “The most important thing is to earn the trust of the people and I am working hard to do just that. I would be honored to represent our district in Springfield and fight to make Illinois a better place to live, work and raise a family."